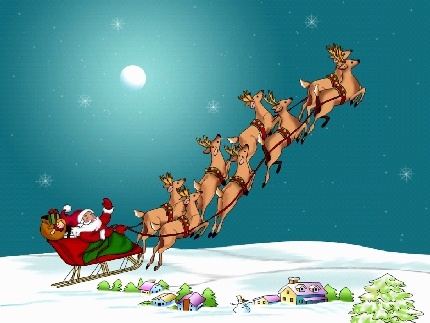 At his home somewhere at the North Pole, Santa Clause has a stable where he keeps his team of flying reindeer which he uses to pull his sleigh through the air whenever he delivers gifts to all the nice little boys and little girls on Christmas eve. Robert L. May entitled “Rudolph the Red-Nosed Reindeer.” According to the story, Rudolph became the lead reindeer pulling Santa’s sleigh because with his luminous nose, he can light the team’s path in the dark even through the inclement weather of winter. Rudolph’s tale has been made into a popular song, a television special, a feature film and various sequels which we all enjoy come Christmas season. Santa’s stable must be very big indeed. Subsequent works of fiction added more reindeer to the nine. · The 1964 Rudolph special features Fireball as one of several reindeer trying out for the sleigh team. Fireball is the son of Blitzen; another reindeer is said to be the son of Dasher and struggles at flying, along with two other reindeer fawns of the same age. A young fawn named Clarice is also featured and eventually becomes Rudolph’s love interest. Donner is portrayed as Rudolph’s father. · The 1979 feature film,Rudolph’s and Frosty’s Christmas in July, features an antagonist reindeer named Scratcher. · “Lightning”, from a 1996 Sesame Street Christmas special, “Elmo Saves Christmas”, is a reindeer-in-training. · The 1998 feature film, Rudolph the Red-Nosed Reindeer: The Movie, introduces Mitzi as Rudolph’s mother and Blitzen’s wife. It also features two other reindeer named Zoey and Arrow. · In the 1999 TV special Robbie the Reindeer, Robbie is assumed to be the son of Rudolph. He has a nose that allows him to jump and fly farther and faster than most reindeer. 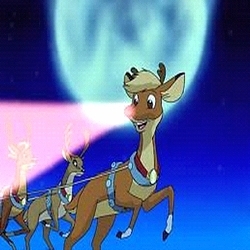 · Chet is a young reindeer in training who is introduced in the 2002 feature film, The Santa Clause 2. · The 2002 South Park Christmas special, “Red Sleigh Down”, introduces an entirely new fleet of reindeer after the traditional reindeer are killed, when the sleigh was shot down as Santa was trying to bring Christmas to Iraq. The substitutes are:Steven, Fluffy, Horace, Chantel, Skippy, Rainbow,Patches and Montel. · In the 2006 TV special Holidaze: The Christmas That Almost Didn’t Happen, Rusty is said to be Rudolph’s brother. Unlike the other reindeer, Rusty is flightless, so instead assists Santa and the other reindeer from air traffic control. · The TV series, My Friends Tigger & Pooh, introduced a special Super Sleuth Christmas Movie in 2007 that includedHolly, a young reindeer fawn. · The 2008 television special, The Flight Before Christmas, features Nico, Prancer’s illegitimate child from a one-night stand with a regular reindeer. The young Nico goes to the North Pole to seek his father. · Thrasher is a top-secret, over-sized reindeer introduced in the 2009 Disney special Prep and Landing. He leads the titular “prep and landing” team of elves in a sleigh ahead of Santa Claus’ main sled. · L. Frank Baum’s 1902 story The Life and Adventures of Santa Claus includes a list of ten reindeer, none of whom match the names of the versions found in “A Visit from St. Nicholas.” Flossie and Glossie are Santa’s principal reindeer in Baum’s story. Claus gathers eight more reindeer, named in rhyming pairs: Racer, Pacer, Fearless, Peerless, Ready, Steady, Feckless, and Speckless. · Olive, from a 1997 children’s book and 1999 television special entitled Olive, the Other Reindeer, is not a reindeer but a dog. She mistook a news report regarding the plight of Blitzen as a “help wanted” ad and heads to the North Pole, where she fills in for him for the year. · The comic strip Over the Hedge (which was made into a 2006 film), added a character named Ralph, the InfraredNosed Reindeer, who is Rudolph’s brother and has a nose that emits infrared heat. · The 1959 novelty record “The Happy Reindeer” is sung by Dancer, Prancer, and an additional reindeer who is nicknamed Nervous (derived from a gag in the introduction in which the other reindeer ask him if he is nervous, which he denies). · The Ray Stevens song Santa Claus is Watching You, features Clyde, a camel borrowed from Stevens’ previous song “Ahab the Arab”, who replaces Rudolph for the year. The song also lists the original fleet of reindeer plus two other reindeer named Bruce and Marvin. Later editions of the songs add a longer more rambling list: Leon, Cletus,George, Bill, Slick, Do-Right, Ace, Blackie, Queenie, Prince, Spot, and Rover. · Joe Diffie’s 1995 single “Leroy the Redneck Reindeer” features Leroy, who is Rudolph’s cousin. · Parokya ni Edgar’s 1998 Christmas single “Olops,” from the album Jingle Balls Silent Night Holy Cow, features Olops, who is Rudolph’s cousin. · Adolph, The Racially Pure Reindeer was the brother of Rudolph in a Christmas stage show by Big Nazo puppets in 1993.
webmaster of Countyfairgrounds.net , CountyFairsUSA.net, and HalloweenEventsUSA.com. I love, knitting, organic food, running, web techie (well about 75% of the time) , and my dogs Freddie and Scamp, Tucson and the Rocky Mountains.